Mike Cubbage did his best to keep Jim Palmer out of Cooperstown. Facing the future Hall of Famer, Cubbage teed off on Palmer for a .394 average. He collected 13 hits, according to the ever-trusty http://www.retrosheet.org/. “I saw Palmer well. Strange, because he was more of a high fastball pitcher and I was a low fastball hitter. Anyway, also saw his curveball and change-up well. 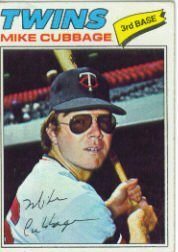 Am I the only fan on earth who thought it would’ve been great to have Mike Cubbage play for the Cubs? After all,. his name wasn’t Mike TWINage! Broadcasters would have feasted on that wordplay. The humble hitter chose to ignore his four RBI, accounting for a 6-3 win. Tomorrow: Cubbage recalls his mastery of Hall of Famer Jim Palmer. That’s one of the best, most impressive, gifts you can give a former player. Don’t just say, “I read about you.” If you quoted a fact from http://www.baseball-almanac.com/, such as a uniform number, say so. You don’t have to send a bibliography. Just show that you’ve gone the extra step. A 79-year-old former Cub printed off a two-page feature about himself that he found on the ‘net. He included this with his page-long letter. Some guys might not be signing for everyone. Compete. Stand out. Show each person you write to that you’ve done your homework. 1. www.SportsCollectors.net. Invest in a collector. For $14.99 a year, here are daily updates on the world of autographs. It’s the chance to share what you’ve learned and benefit from the wisdom of the best hobbyists out there. A great community. 2. www.SportsAddressLists.com. Harvey Meiselman charges $35 for the ultimate baseball address list. He finds the unfindable, sharing ways to reach everyone in baseball’s past and present. This is a valuable tool no collector should be without. 3. Postage stamps: Ask your mail carrier for a “stamps by mail” order form. Get the stamps sent to the collector you want to treat. We don’t need a lottery ticket for a $1. For two “Forever” stamps, we get more excitement and better odds. By the way, “Forever” stamps are best. The self-addressed, stamped envelope might not get returned before the next postal increase. That autograph return could be kept in postal detention for the sake of an extra few cents owed. 4. Office supply gift card: Collectors have endless appetites for envelopes, computer printer ink and paper. Keep us well fed, and we’ll be happy through the winter. 5. Time: This one is the easiest and hardest. Ask, “What’s new with your collection” Then, truly listen. Your collector loves baseball and the hobby. Getting to tell someone why both are special is a joy. That might be the best gift of all. Merv Rettenmund always hustled. He’s still hustling today at http://www.mervrettenmund.com/. Most remember him as the scrappy Baltimore outfielder, someone who might hit .300 in his sleep. He credits Orioles coaches Jim Frey and Billy DeMars with hitting wisdom that inspired him to become a coach, too. Collectors know “The Hit Man” as a willing signer, although someone who tired of squeezing every letter into each autograph. By the way, I smiled at the compact facsimile autograph on the 1971 Topps. 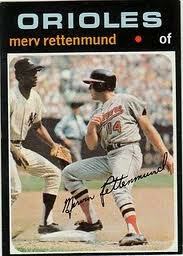 For years, I’ve seen Rettenmund take two lines to sign cards, stacking his first name atop his long last name. 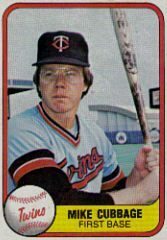 I asked him about the twilight of his career, when he led the National League with 21 pinch-hits in 1977.